We always enjoy writing about the vast network of volunteers that make up the global e-NABLE community, who collaborate to make free 3D printed prosthetic hands available to the people who need them, whether they’re donating money and supplies through the MatterHackers community sponsorship program, or learning how to create and build 3D printable prosthetics themselves. So, in a continuing effort to find ways to support their mission to offer a ‘helping hand’ to those in need, e-NABLE is working to create new fundraising opportunities, to expand their global reach and keep making a positive impact on the lives of the people who reach out for help. There are already a number of ways that followers can give assistance to the network, such as donating gift cards to the various e-NABLE community chapters all over the world, or making a donation directly to a chapter in need; you can also make a general donation to assist in covering the costs of upkeep and the work being done on the website. You could visit the e-NABLE Shop and purchase handmade items like jewelry, magnets, note cards, and holiday ornaments; as the prices don’t go higher than $15, it won’t break the bank, either. 100% of the proceeds from e-NABLE Shop purchases support the e-NABLE website and the non-profit e-NABLE Outreach, which was created to support the global chapters by funding new programs and purchasing necessary materials. If cute jewelry and magnets aren’t your thing, why not purchase a cool tee-shirt, sticker, or coffee mug from e-NABLE’s USA or Europe-based spring campaign? Again, the prices seem to be pretty reasonable – the most expensive item was a $50 sweatshirt. Last year, their collaborative Within Reach design challenge with MatterHackers, Pinshape, and Ultimaker resulted in over 200 entries and new open-source tools, like a simple nail guide, a zipper aid, and a keyboard typing tool, for those who need them the most. e-NABLE is excited to announce that they will again be partnering with MatterHackers and Pinshape, along with LulzBot, for a completely new design challenge this year, and even more excited to see what new tools people will come up with. The contest will begin in mid-March, and classrooms all over the world are expected to participate; subscribe to the e-NABLE blog to make sure you don’t miss the deadline! The challenge will take participants from the global e-NABLE community in a new direction as they “explore the power of ideas” while making a difference in other peoples’ lives; stay tuned for more information. e-NABLE will be releasing its new digital badging system soon, which they’ve been working on for several months. The badges will let volunteers share their gifts, contributions, and achievements with the e-NABLE community on their own social media pages. It will give volunteers incentive to challenge themselves to learn and try new skills, give e-NABLE the chance to thank their amazing sponsors, volunteers, and supports, and keep students and teachers engaged in the e-NABLE community. K-12 and home school students who may not have access to a 3D printer, but are interested in joining the e-NABLE movement, will be able to earn these digital badges by participating in fun activities and educational games. 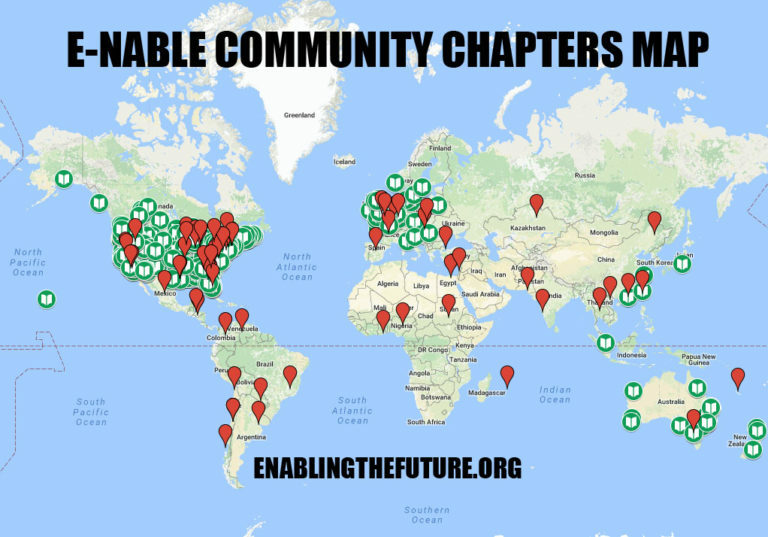 There are many more ways to help, from creating your own e-NABLE chapter, to contacting e-NABLE if you have any great ideas for additional fundraisers and would like to help raise money for a chapter in need. e-NABLE is also interested in speaking with companies, businesses, or other organizations that may be interested in being a sponsor for a potential e-NABLE conference. Discuss in the e-NABLE forum at 3DPB.com.